The ESTO Project „European Specialist in Traditional Orchards” is a European project supported by the Leonardo da Vinci Lifelong Learning Programme. It involves partner organisations and other associated experts in the field of traditional orchard farming and management and education from six European countries - Austria, Poland, Hungary, Denmark, France and Germany. Traditional orcharding in Europe has had a changing history over the last decades. In some regions there exist still agricultural models guaranteeing the continuity and development of this hot spots of biodiversity, but in other regions changes in land use, missing marketing actions and the widespread loss of professional knowledge about traditional orchards are threatening their survival. The current lack of educational opportunities to gain comprehensive and specialist knowledge about the different aspects of care and management of traditional orchards is therefore the main motivation for our initiative.The overall aim of the project is to contribute to keep traditional orchards as a multifunctional (ecological and economical) sustainable system guaranteeing high biodiversity. Developing of new and innovative ways of teaching and learning will help to maintain their characteristic landscapes in a 21st century surrounding. The "Guide for the standard fruit tree growing" is part of the expert texts/teaching material developed within the ESTO – “European Specialist in Traditional Orchards” project. The guide enables through the provided expert knowledge and advices to learn to read a fruit tree. With described rules and techniques an ideal fruit tree can be grown. 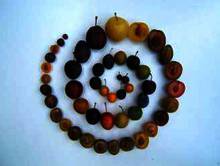 An ideal fruit tree combines the use as well as natural growth principles of the tree. The material is available in German language. ESTO short film on TONGUE GRAFTING is here! The ESTO video-clip on toungue grafting available in all partner languages (English, Danish, German, Polish, Hungarian, French). The ESTO video-clips reached more than 10.000 clicks in the beginning of March 2015!